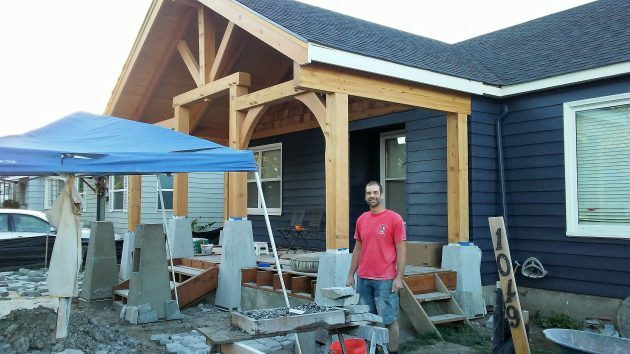 Ben Bliesner is building this porch at the Albany home of this sister’s family. The remarkable porch addition I wrote about a month ago is coming along, and it’s getting more impressive as the labor-intensive work progresses. I first noticed this unusual addition to a house in the 1000 block of 14th Avenue S.W. on a bike ride in July. On another ride past the place this week, my wife and I met Ben Bliesner, who is building the porch for his sister and her family, Jessica and Shawn Morgan and their two boys. It’s probably no coincidence that the structure looks a little like a mountain lodge. Bliesner built the framework out of solid Douglas fir timbers he milled himself from trees on his property on Mt. Hood, where he lives. Now he’s adding a rock facing on the foundation pillars. He got the rock from a quarry on Mt. Hood as well. As Jessica told me earlier, the Morgans bought the modest house, built during the war in the 1940s, last fall. They originally intended it as a rental but liked the neighborhood so well they decided to live there instead. And, she said, the porch her brother was building for them was just what she had wanted.